The US continues deploying troops to the Asia-Pacific region amid escalated tensions on the Korean peninsula. MOSCOW (Sputnik) — The United States, South Korea and Japan have started the fifth cross-navy exercise off the Japanese and South Korean coasts since June 2016, where the sides will jointly practice detecting and tracking missiles launched in North Korea, the NHK broadcaster reported Tuesday, citing the Joint Chiefs of Staff of the South Korean Armed Forces. The drills, which are expected to carry on for two days, are held to make sure the three countries are ready to repel possible threats from North Korea together. The exercise has reportedly brought together several destroyers equipped with the US-made Aegis Combat System, a radar complex designed to track and guide enemy weapons. The drills' program reportedly includes a simulation of a ballistic missile launch. According to the US Department of Defense, the United States and South Korea are also conducting their largest drill to date, dubbed Pacific Thunder, which involves 20 US squadrons and nine South Korean fighter wings, to rehearse search and rescue techniques during combat. "We are the close muscle, so essentially we are the bodyguards of the person on the ground and the helicopters that are rescuing them," 25th Fighter Squadron Pacific Thunder 18-1 Coordinator Capt. Travis Vayda stated. "Obviously in a CSAR [combat search and rescue], you don’t want to have another type of shoot down or anything happen." On October 23, the US also deployed the US Eighth Army to South Korea as a part of regular non-combatant evacuation drills, dubbed Courageous Channel. As a part of the drills, the troops will stay in the region until October 27. Besides this, last week Washington and Seoul launched a joint Maritime Counter Special Operations Forces Exercise (MCSOFEX), repeatedly criticized by the North and treated as a potential threat. 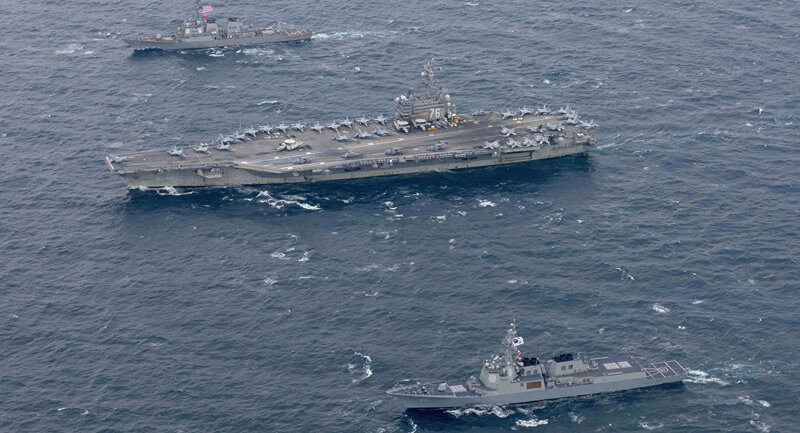 These drills required the deployment of 28,000 troops to South Korea and US aircraft carrier USS Ronald Reagan and Arleigh Burke-class destroyers USS Stethem and USS Mustin to tackle the claimed Pyongyang's threat.